Would become Squamish Hotel and then later the Ocean Port Hotel (37991 Second Avenue). 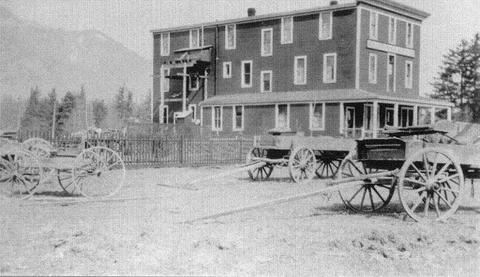 Although the original building has been altered nearly beyond recognition, the basic structure of the Squamish Hotel was constructed in 1910 as the King George Hotel by W.A. Holland. Like the Brackendale Store, the Squamish Hotel is a building which may hold heritage value to the community not for its present appearance, but for its prominence as a landmark and reference point in the local landscape for over 75 years. Current use: Hotel, pub, restaurant, Cold Beer and Wine Store. Current condition: Nearly unrecognizable from the original form.